Please note DIL Houston 20th Anniversary Grand Gala occurred in past. 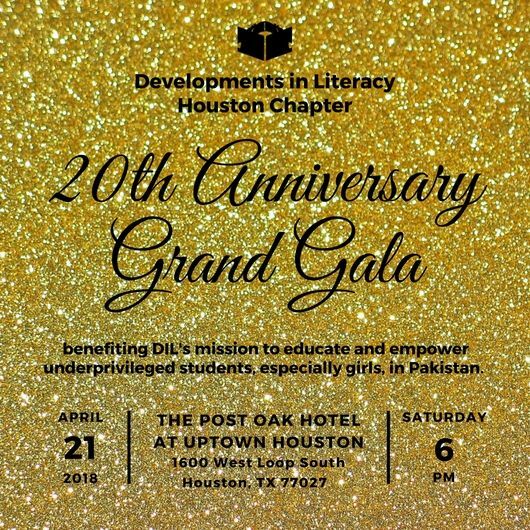 Please join Developments in Literacy, Houston Chapter, for a night to remember at our 20th Anniversary Grand Gala on Saturday, April 21st at The Post Oak Hotel. The evening is promised to be filled with great food, inspiring people, plenty of dancing and tons of fun, all in support of educating and empowering underprivileged children, especially girls, in Pakistan. **Disclaimer: Due to Hurricane Harvey postponement, seats will roll over for those who purchased tickets and sponsorships in 2017.